When I was in school, and also in life in general, I tend to be a GoodyTwoShoes. I ran this word together because Pete only allows ONE word before "Tip of the Day." Anyway, I think it paid off for me, because my brother definitely is not that, and it got him in a little trouble. (Which was well-deserved.) The tip is this. If you're on a mission trip and asked to memorize verses, or read a book, DO IT. Otherwise, you may be on your youth pastor's "hit list." This is NOT a good list to be on, especially in a third-world country with poor sewer service. Someone is guaranteed to put toilet paper in the toilet, and when it comes time to unclog it, if you're on the hit list, you probably will be the one to do it. So, being a good kid and doing what you're asked may not always be fun or convenient, but you'll have your laugh when you're NOT the one fishing toilet paper out of a clogged toilet. 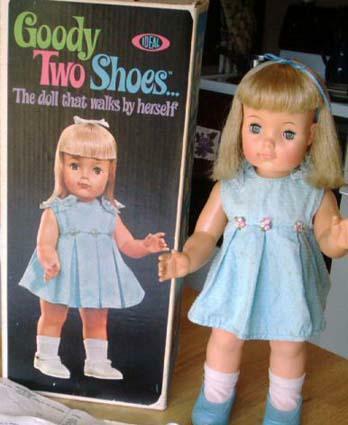 I think that little goody two shoes doll is the scariest picture we've had yet! the House Selling Tip of the Day and the Work Sweater Tip of the Day. Some people make a living cleaning up others people's crap. No need being a goody two shoes and doubling the crap! It already stinks, right? Pete, you just topped the doll. Thanks for that!